While we all love a good high heel, it is safe to say that the ballet flat has become a wardrobe staple. This shoe is chic, comfy, and can be paired with just about anything. From a casual outfit consisting of a blouse and skinny jeans to a formal evening gown, the dependable ballet flat has got your feet covered. Packing a pair in one’s bag in the event that your heels get too uncomfortable has become a life-saving technique to survive a night out. How did we ever get along without them? The origin of the ballet flat is a no-brainer (ballet shoes, duh.) However, these flats weren’t worn offstage until relatively recently. Also, in the early days of ballet, the shoes weren’t flat at all. That’s right; ballerinas used to dance in high heels. Back in those days, it was all fashion over function for the ladies. And we thought pointe shoes were bad. This original ballet shoe (the high-heeled version) made its first appearance in 1680’s France in the ballet school at the Royal Academy of Dance. One could assume that the ballet performances during this time were probably not very exciting- these shoes were not easy to wear, and rendered dancers completely unable to perform jumps and a significant portion of other technically difficult movements. This was highly problematic issue for what was supposed to be an athletic shoe. Fortunately, people eventually realized that it was more important for ballet dancers to show off their beautiful technique rather than beautiful footwear. It helped that high heels fell sharply out of fashion after the French Revolution. Supposedly, a huge factor in this drop in popularity can be attributed to Marie Antoinette. The former queen was said to have made her walk to the guillotine while wearing a pair of high-heeled shoes. Unsurprisingly, Antoinette’s heel-clad beheading turned many French women off from the style, preferring flats instead. By the 1880’s, Salvatore Capezio (yes, that Capezio) had crossed the sea from Italy to set up shop in America; coincidentally, right across the street from the Metropolitan Opera House. This prime piece of real estate brought the cobbler a slew of customers- all ballerinas looking to have their well-worn shoes repaired. After clocking in a significant amount of hours fixing ballet slippers, Capezio learned a lot about them. So much so, he decided to design a better ballet shoe that would need fewer repairs. The result was a huge success, ballerinas loved Capezio’s shoe so much, that in 1910 Anna Pavlova bought a pair for each member of her company. The talented Capezio was the link that brought the ballet flat from the dance world into the fashion world. Fashion designer Clare McCardell fell in love with the simple, elegant look of ballet flats, so much so that she went straight to Capezio himself and asked him to create a version that could be worn off-stage. By adding a hard sole to the classic design, the ballet flat was instantly made wearable. McCardell even incorporated her own fabrics into the shoe designs so that the flats would match the clothes she had created. She showed her ballet flat collaborations with Capezio in her 1941 collection. A little over a decade later, the ballet flat really took on a life of it’s own outside the stage. By the late 1940’s, famed shoe designer Rose Repetto had gotten in some experience creating ballet flats. She made pointe shoes for her son Roland Petite that had gotten quite popular with ballet companies around the world. However, her most iconic design that brought the ballet flat into the mainstream was inspired in 1956 by none other than Brigitte Bardot. At the time, Bardot was shooting the Roger Vadim film “And God Created Woman.” She commissioned a pair of red ballet flats from Repetto to wear in the movie- needless to say the chic yet comfortable shoes were a hit both on and off screen. The shoes went into mass production and sold extremely well. The following year in 1957, another style icon, Audrey Hepburn, sported a black pair of ballet flats in the film Funny Face. Much like the little black dress, Hepburn helped catapult the ballet flat to closet staple status. 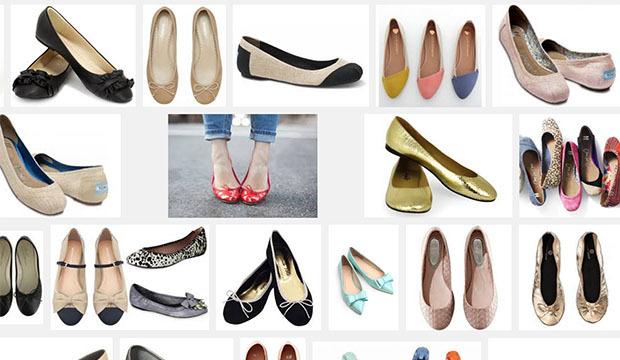 Today, the ballet flat is ubiquitous; nearly every woman owns a pair. Designers continue to create their own versions- a particularly iconic example is the Tory Burch flat. This ballet style, with it’s perfect melding of form and function is likely to remain a staple for years to come.